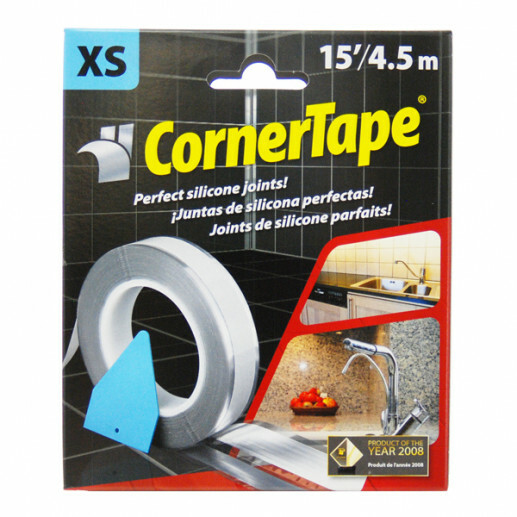 CornerTape is a brand new product which when used, automatically sets a pair of perfectly parallel tapes which is unlike normal masking tape. CornerTape is also very fast to apply, again unlike normal tape. After CornerTape is applied you simply fill the preset gap with silicone sealant and smooth it out using the enclosed forming tool (No Finger Needed), remove the silver CornerTape to reveal a perfect silicone joint. It can be used with every type of sealant around kitchens and bathrooms. Extra Small is ideal for sealing small gaps like those found around marble/stone kitchen worktops. Always choose CornerTape that is wider than the gap to be sealed.